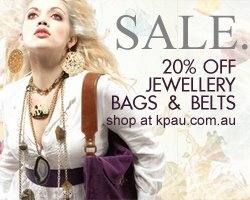 Always original, never mass produced - Kpau has the largest range of unique and handcrafted designer accessories on offer and with 20% off its entire range, including distinctive statement pieces to classic essentials, now is the perfect time to update your wardrobe or get in early for Xmas. On sale are unique jewellery pieces from Australian designers such as Sophie Kyron, Samantha Wills and Damselfly as well as US designers Steven Shein and Jan Michael's vintage inspired pieces. Pick up handcrafted and original bags from Pratten, Foxes, OraniaZana, Madame Mooi and Isabella. And with fantastic savings to be made, this is your chance to get coveted belts from US label Linea Pelle. This online Kpau Sale ends 8 November but with limited stock, get in quick.